Great leadership is a big part of success. Great communication is a massive part of effective leadership. Consider some of the more recent great leaders: Gandhi, Martin Luther King Jr., John F. Kennedy and Nelson Mandela to name a few that come to mind immediately. All were powerful leaders because they inspired people to follow them. They had an undeniable ability to express their vision and were therefore successful in achieving their goals. Whatever your business or organization, you need to be a leader who inspires your team to reach the top. To get people to take notice of you and follow you, they need to know your specific values and vision. In order to establish the right environment for them to thrive and grow, they need to know you share at least some of their own values and vision. You may think that it’s pretty obvious that values are important. But it seems that values, both personal and professional, seem to be something that is “taken for granted”. It’s important to discuss values so that everyone is on the “same page” with their team. It’s better to know what the organisational and personal values are before, rather than during the interview prior to the person being hired. Clearly knowing your personal and organization values can only help you to lead more effectively. What would you like your life to demonstrate? What are you willing to do to get new business? Do you have a professional mission statement? Great leadership is not about changing values over time or manipulating those values to achieve short-term success. A consistent core value system forms a strong foundation that brings long-term success. A good way to define your values is to say they are the rules by which you play the game. A well-defined value system helps you to more easily make decisions and encourages your team to follow your lead. It’s easy to “say” you have a vision. That you know the direction you are taking for your business. After all, it’s your lifeblood and you know it inside out. Great leadership comes with a great vision, so writing your vision down is an important step. You will need to share it with your team too. One very important thing to remember: your vision for the business needs to be clear and concise so that everyone on the team, no matter what their job is, can see exactly the direction to be taken and the importance of their role in achieving the goals. The clearer the concept and the clearer your message is, the more likely you, and your team, can reach the goal. Your vision needs to incorporate the answers to three questions. What’s more, it must answer those questions for every team member.What do we do? For whom do we do it?In the book From Good to Great, Jim Collins proved that this is not a 30 minute, one meeting exercise. It requires 100% participation. It needs to be more than a top-down decision; it must be fully inclusive of everyone taking part. “You must capture and keep the heart of the original and supremely able man before his brain can do its best.” ~ Andrew Carnegie. When you fully understand your team members and what their beliefs are, you can serve them and allow them to achieve full potential. It’s important you value their uniqueness. Think of your team members as your internal customers. It’s vital for you to treat them at least as well as your external customers. Like giving then the highest level of customer service. Shaping the right work environment will help you to have loyal team members to lead. This means you need to develop a work environment that respects each person, appreciates them and rewards their effort. This also helps to encourage an openness to change. It needs to be a safe environment that encourages trying new ideas. Encourage personal creativity so that each team member has a stake in the outcome. This is creating an environment that promotes growth at all levels. 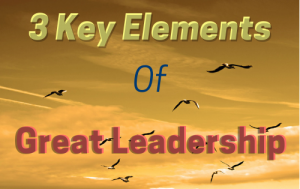 Combine all three elements and you have a formula to develop great leadership that inspires greatness in others that leads to breakthroughs and successes all day long.